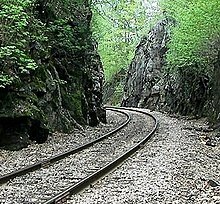 Phineas P. Gage (1823–1860) was an American railroad construction foreman remembered for his improbable[C] survival of an accident in which a large iron rod was driven completely through his head, destroying much of his brain's left frontal lobe, and for that injury's reported effects on his personality and behavior over the remaining 12 years of his life, effects so profound that (for a time at least) friends saw him as "no longer Gage." 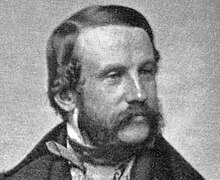 Macmillan carries out a comprehensive analysis of accounts of Gage (scientific and popular), finding that they almost always distort and exaggerate his behavioral changes well beyond anything described by anyone who had contact with him. 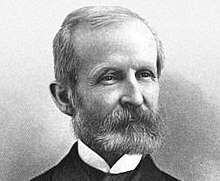 [E] In the words of Barker, "As years passed, the case took on a life of its own, accruing novel additions to Gage's story without any factual basis", and even today (writes historian Zbigniew Kotowicz) "Most commentators still rely on hearsay and accept what others have said about Gage, namely, that after the accident he became a psychopath..."
Attributes typically ascribed to the post-accident Gage which are either unsupported by, or in contradiction to, the known facts include mistreatment of wife and children (of which Gage had neither), inappropriate sexual behavior, an "utter lack of foresight", "a vainglorious tendency to show off his wound", inability or refusal to hold a job, plus drinking, bragging, lying, gambling, brawling, bullying, thievery, and acting "like an idiot". Macmillan shows that none of these behaviors is mentioned by anyone who had met Gage or even his family;[E] as Kotowicz writes, "Harlow does not report a single act that Gage should have been ashamed of." ^ a b c d e Accounts of Gage are compared to one another, and against the known facts, at Macmillan (PGIP):C and in Macmillan 2000.:esp.116-19,ch13-14 According to Macmillan& Lena (2010, and see also Macmillan 2000):11,89,93,116 available sources which offer detailed information on Gage, and for which there is evidence (if merely the source's own claim) of contact with him or with his family, were limited (until 2008) to Harlow (1848, 1849, 1868); Bigelow (1850); Jackson (1870);; Jackson (1849). Macmillan & Lena (2010) present previously unknown sources discovered post-2008. Macmillan (2001):161 and Macmillan (2000):94 discuss the high general reliability of Harlow (1868), and its primacy as a source. The contrast between Gage's celebrity, and the small amount known about him, is discussed in Macmillan (2000)::1-2,11 "From my student days I had some appreciation of the importance ascribed to the case and expected there would be a reasonably extensive literature on it. This turned out not to be true. 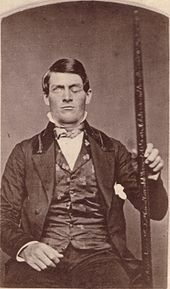 There were many mentions of him, but few papers solely or mainly about him... [In my early research I had assumed that] because Phineas Gage was said to be important in psychology, everyone would have been interested in him; because his survival was so remarkable, someone must have made a major study of him. Neither was the case." ^ a b c See Macmillan (2000):25-7 and Macmillan (PGIP):A for the steps in setting a blast and the location and circumstances of the accident. The blast hole, about ​1 3⁄4 inches (4.5 cm) in diameter and up to 12 feet (4 m) deep, might require three men working as much as a day to bore using hand tools. The labor invested in setting each blast, the judgment involved in selecting its location and the quantity of powder to be used, and the nature of employer-employee relations on this type of job, all underscore the significance of Harlow's statement that Gage's employers had considered him "the most efficient and capable foreman in their employ" prior to the accident. ^ a b c d e f g Barker, F.G.II (1995). "Phineas among the phrenologists: the American crowbar case and nineteenth-century theories of cerebral localization". JNeurosurg. 82: 672–682. PMID 7897537.